Photo by Alan Olson Road work along W.Va. 2 continues in Marshall County. It is projected to wrap up by October 2019. 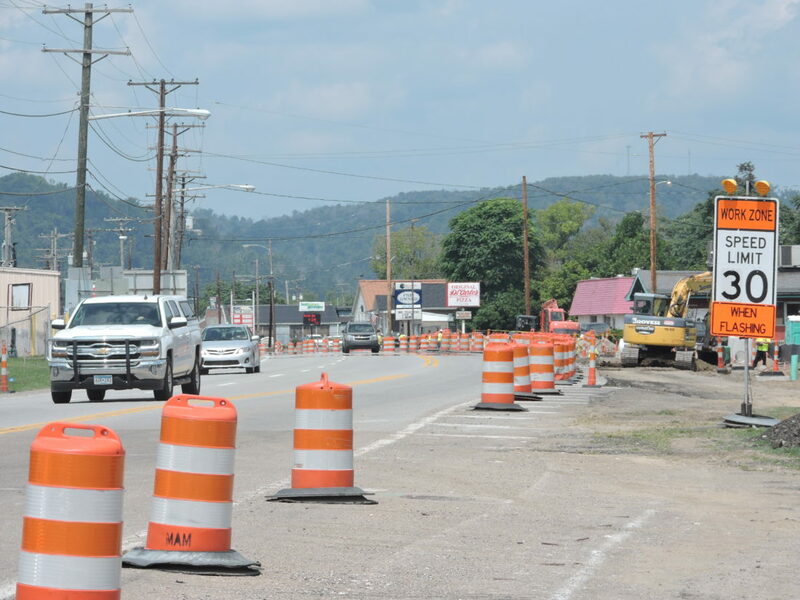 MOUNDSVILLE — While road work on W.Va. 2 throughout northern Moundsville may have more than a year left, motorists will have a respite as the Jefferson Avenue extension along U.S. 250 is set to open during the first week of September. Meanwhile, the traffic tie-ups in Moundsville and Glen Dale have had businesses along the project routes concerned. Scott Reager, executive director of the Marshall County Chamber of Commerce, said he has fielded several calls in recent weeks from businesses about the road work. However, he said, most had been understanding. “I’ve called down to the (West Virginia) Division of Highways several different times, just to check on the progress, because they’re definitely feeling the pinch,” Reager said. “There’s been a lot more traffic on W.Va. 2, especially at the plaza, businesses like Domino’s and stuff like that. As a result of the road construction, the New Happy Garden Chinese buffet announced that it would be closing its doors Saturday and relocating up the street near Tractor Supply Co. in Glen Dale. However, by Monday afternoon, the business was closed during normal business hours and could not be reached for comment. Joe Juszczak, DOH District 6 traffic engineer, said work on the extension, which had been closed for several months, is set to wrap up early September. That will allow traffic to resume between Jefferson Avenue and U.S. 250 behind Walmart and re-enter W.Va. 2 just north of the city limits. The road has been rebuilt at a 90-degree angle at the intersection with W.Va. 2 and will include a traffic light. Traffic has been routed through Moundsville along Fifth Street while the extension has been closed. Work on W.Va. 2 continues between Glen Dale and Moundsville. The state is widening the highway to two lanes in each direction with a turning lane between. The $15 million project — which Juszczak said remains on budget — will continue through October 2019. Juszczak said once the work on U.S. 250 wraps up, the next phase of work will be on two small bridges: one close to Monarch Stadium and the other near the entrance to the Walmart plaza. The bridges cross small creeks and may not be obvious to the casual observer, but are marked by concrete rails. Work on W.Va. 2 also consists of replacing gas and sewerage lines, while electric lines also are being moved through the area. The final phase of the project will be paving.